The School of Nursing and Health Sciences educates and empowers the next generation of healthcare professionals by equipping our students with the knowledge and skills to influence health policy and service delivery. The School transforms lives through its excellence in research, teaching and scholarship. We deliver a broad range of world class research-led undergraduate and postgraduate education that directly improves health outcomes at home and overseas, and we benefit significantly from our pioneering interdisciplinary research that has social, cultural and economic impact. The School boasts an inspirational, skilled, friendly and enthusiastic team whose research and education activities have real impact. You will be encouraged to share your ideas to push the excellence within the School further to help us keep transforming the lives of others. We are recruiting for an exceptional Post-doctoral Research Assistant within the Mother and Infant Research Unit for a project to develop an evaluation toolkit to enable local evaluation of the continuity element of Scottish Government’s recent report - The Best Start: A Five-Year Forward Plan for Maternity and Neonatal Care in Scotland. This position is part-time, 60% FTE. Hours to be agreed with the successful candidate. You will have experience in one or more of a range of health services research skills, including evaluation methods, literature review, and report writing. You will be committed to the use and application of evidence to improve health and care, particularly within maternity care. A commitment to team-based research and active engagement with policy and practice are important requirements of the post. Working with the SMART group and NHS staff from Best Start early adopter sites to develop a set of evaluation tools and methods. This will involve collaboration with academics and practitioners across Scotland. · Building effective relationships with maternity care professionals across Scotland. · Collating and analysing information about care models. · Developing an evaluation strategy. · Working within the SMART group to produce timely outputs. · Knowledge and understanding of maternal and child health. · PhD or equivalent in health services/sciences or related research methods. · Knowledge of current research methods. · Understanding of the use of evidence in practice and policy. · Experience of using relevant packages such as SAS, Stata, SPSS or similar statistical packages, RevMan, EndNote, NVivo, Atlas.ti, or equivalent. · Willing to split time between sites (Stirling University and University of Dundee). We are one of the UK’s leading universities – internationally recognised for our expertise across a range of disciplines and research breakthroughs in multiple areas, including science, medicine and engineering, amongst many others. Conveniently located on the banks of River Tay, our main city-centre campus is at the heart of Dundee - an up-and-coming, friendly, compact and affordable city with a rich heritage in design and technology. We also have campuses at Ninewells Hospital and in Kirkcaldy which are easily accessible via local transport links. 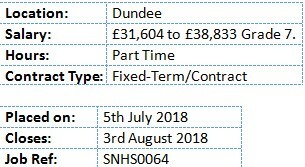 For further information about this position please contact Dr Andrew Symon ata.g.symon@dundee.ac.uk. To find out more about MIRU please visit https://nursing-health.dundee.ac.uk/.